Posted By:Unknown | At:7:06 AM Be the first to comment! I hope you all had a wonderful Martin Luther King Jr. holiday. I most certainly did. I decided to use the King holiday as a day of service so I performed some volunteer work. I would love to hear what you all did to commemorate Dr. King. Now speaking of commemorations, there has been a lot of news made of late surrounding the latest biopic of Dr. King's life starring Jamie Foxx. The most recent news has to do with the fact that acclaimed producer Oliver Stone decided to drop out of the project after the King family refused to let him depict King's infidelities. I realize that many of us are well aware that Dr. Martin Luther King, Jr. was not a perfect man, but is this something you wished to see depicted in a film? Many of us have a way of making a person a saint in death when sainthood was the furthest thing from the truth as it relates to the person. 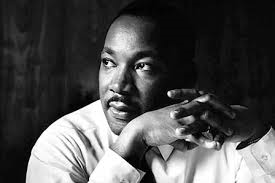 Does the fact that Dr. King wasn't a faithful husband diminish all the things he accomplished, or does depicting his flaws show how a perfectly normal and flawed human being is still capable of accomplishing the extraordinary?